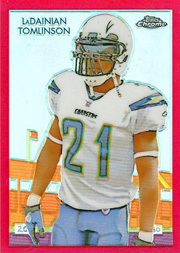 LaDainian Tomlinson is the reason I got back into collecting sports cards and memorabilia after a lengthy absence. To prove that's no hyperbole, allow me to back up a step and explain. I grew up in the 1980s collecting cards from all four of the major sports, with the biggest chunk of my collection devoted to football. But I drifted away in the mid-90s due first to college and later to financial considerations as I attempted to start a career. My love of sports certainly never wavered, and getting back into the hobby intrigued me. I never took the leap, though, until one random slow night working my second job at a local mall. My store manager sent me to the drug store to buy him a drink, and while I was there, I checked out the selection of retail packs. I'd done that many times before, but that night 2001 Press Pass Football really caught my eye, and since I had a few extra bucks, I decided to buy a pack. When I got back to the store, I was surprised to find a Tomlinson autograph inside. As a big college football fan, I knew he had rushed for over 2,000 yards in one of his seasons at TCU and was the No. 5 overall pick in the 2001 draft. I also knew you could pull signed cards from retail Press Pass packs, but I didn't figure I'd hit one, and certainly not one of a player of LT's caliber. I was hooked, and over the next few years, I threw myself back into the hobby full force, collecting, working for a card store for a while and eventually going on to write about cards and collectibles for various outlets. My Tomlinson collection was never my primary focus (I'm a lifelong Cowboys fan), but since he set me on my way and was so much fun to watch - and seemed classy off the field too - I amassed some fairly nice items: plenty of autographed and memorabilia cards, an autographed mini helmet and all of his McFarlane figures. So it was with a certain degree of sadness that I read about LT's inevitable break up with the team for whom he starred for most of the last decade. Everyone knew it was coming, but it was still kind of surreal when it actually happened. It's interesting to think that Tomlinson was acknowledged by many people as the best player in the NFL in the middle of the last decade, and yet he still seems a tad underappreciated. Part of that was playing in San Diego, where the spotlight simply isn't as bright as it is in some of the bigger football markets. I also think there might be a little bit of a lack of awareness about where LT stacks up with the best backs in history. As he stands right now, he's eighth all time in rushing yards, second in rushing touchdowns, third in overall touchdowns and comfortably in the top 10 in receptions for a running back. Even if his attempts to continue playing fizzle out, he's a lock to enter the Hall of Fame as soon as he's eligible. Even in the hobby, it took people a while to warm up to Tomlinson's greatness. Entering the league in 2001, his cards carried nice values but were somewhat stuck in the shadow of Michael Vick's rookies. It didn't help that Vick's 2001 SP Authentic autographed patch card reached iconic status while LT's card from the same set had no autograph (nor did his SPx rookie) and a higher print run. It took Vick's fall from grace and Tomlinson's continued assault on the record books to propel his cards to their peak values in early 2007. They've been falling since about mid-2008, to the point where they have basically returned to their 2001 levels. That's not bad, but less than you might figure for someone who's done pretty much everything except win a championship. And it's recent champ Drew Brees, not Tomlinson, who figures to be the darling of the Class of 2001 for the near future. With that in mind, it's actually not a bad time to be buying Tomlinson rookies or memorabilia, simply because he's undervalued compared to his production. Notice I didn't say cheap – he's too well known for that – but a bargain by his own standards, especially when he figures to get a bump a few years down the road when he finally makes it into Canton. I figure I'll still add some more cards and collectibles to my LT stash as long as he catches on somewhere before the 2010 season. Rumors have attached him to any number of teams from the Lions (oh no!) to the Saints, and since my interest in him doesn't depend on what team he plays for, it will actually be cool to see him on cards in a different uniform. It will be a little weird, though, and I'm sure I'm not the only collector who will think so. Regardless of what fate holds for Tomlinson on the field or in the hobby, I'm sure I'm going to hold on to that 2001 Press Pass Autograph. I figure I owe LT at least that much.